The TS-1 is a beautifully-made amp, no doubt about it. Massive headroom and definition with all the magic you’d expect. It’s a big, big price tag, but this amplifier is aimed at the very top echelon of players. Perched at the very top of the pro market, Two-Rock has one of the most distinguished artist lists of any amp builder, including top-drawer names such as John Mayer, Joe Bonamasssa, Eric Gales and Oz Noy. Two-Rock was purchased by the Premier Builders Guild in 2010 along with a few other top brands. However, things didn’t work out as planned and PBG folded in late 2016. Fortunately, the brand and rights were acquired by long-time enthusiast Eli Lester and former Two-Rock general manager Mac Skinner. Better still, original designer Bill Krinard has rejoined the operation. Since then, the newly independent Two-Rock, still based in the original Rohnert Park premises, has lost no time in re-establishing its catalogue, with the arrival of two new models, the tweed-inspired Burnside and this head, the eagerly awaited TS-1. Originally released in 2010, the TS part of the model designation stands for ‘Tone Secret’, and ever since, designer Bill Krinard has been developing and evolving the circuit, with several refinements including a clever half-power switch that doesn’t need the usual change of impedance to work. to any Dumble enthusiast, featuring a pair of inputs labelled Normal and FET feeding a single-channel preamp with a footswitchable cascaded gain boost section. Two small toggle switches, Bright and Mid, accent these frequencies, while a third called Rock/Jazz switches the EQ from conventional guitar frequencies to a flatter response. There’s an input volume control followed by bass, mid and treble knobs, ratio (gain) and level controls for the overdrive section and global presence and master volume controls. The relatively sparse rear panel features four, eight and 16-ohm loudspeaker jacks, mains, standby and half-power switches, send/return insert points and a locking XLR socket for the footswitch, which toggles the overdrive and bypasses the tone controls for an extra gain boost. Two small toggle switches act as doubles for when the footswitch isn’t needed. The TS-1’s electronics are perfectly executed, with neat, carefully routed wiring and perfect hand-soldering on each joint. Components are specially selected, including rare NOS parts, and everything is the best quality you can get. Parts and layout are where most of the magic of these amplifiers is made, and the TS-1 is put together with great care and obsessive attention to detail. The TS-1 exudes luxury, excellence and uncompromising build quality, where form follows function with the kind of understated beauty many top-quality handmade objects have. Like similar amps, plugging into the TS-1 is not an instant gratification experience. The cascaded preamp design means the settings used for clean sounds affect those used for overdrive, so some careful balancing and a degree of compromise is required for the best overall result. The more difference between clean and overdriven sounds, the smaller the window becomes. The FET input was originally intended for acoustic guitars with low-output piezos. The FET preamp boosts this signal with very little added noise, then passes it into the front of the valve preamplifier section, while the Normal input bypasses the FET stage. Most passive guitars will work just fine plugged into the Normal input. The TS-1’s clarity and headroom in clean mode is exceptional, perfectly balanced across the guitar’s natural frequency range so that highs and lows don’t overpower each other, with a crisp snap to bass notes and chiming highs with more detail than practically any other amp we’ve experienced. The Bright and Mid switches act as handy presets to dial in single coils or humbuckers; we achieve similarly impressive results with variety of guitars with both kinds of pickup. The TS-1’s idealised D-style overdrive sounds are justifiably impressive, with a rich, touch-sensitive response that really snarls when you dig in and a thick, syrupy voice that punches through in the midrange, with an extra bite in Bypass mode. The clarity, aided by a massive power supply, is just as breathtaking as the TS-1’s clean mode. There are no hiding places with an amp like this - every fluffed note is revealed with merciless precision. However, if you play with conviction, the Two-Rock rewards with stunning power. Intended for top-flight pro use, the TS-1 properly starts to develop its magic with the master approaching halfway, at which point it’s too powerful for smaller gigs, even in half-power mode. 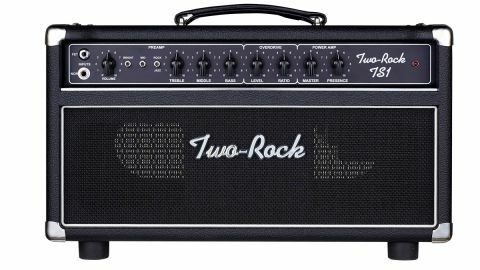 There’s no doubt that Two-Rock’s TS-1 is a superlative amplifier - a musical instrument that outplays just about every Overdrive Special replica we’ve tried, yet with its own distinctive voice. It’s built to Two-Rock’s usual no-compromise standards and will last a lifetime. Such excellence does not come cheap, and at nearly five grand the TS-1 is one of the most expensive heads we’ve ever reviewed. However, compared with the real thing - if you can find one - it’s a bargain. The price of a top-flight PRS, Gibson or Fender is in the same ballpark, so we should be expecting to pay this kind of money for an amplifier of the same calibre, shouldn’t we? However, while a beautiful guitar can give pleasure hanging on the wall in a glass case, the TS-1 only truly justifies itself when it’s plugged in and working at big-stage volume levels, which makes it as exclusive as the amp that inspired it. Aimed at professional players and well-heeled amateurs for whom only the best is good enough, Two-Rock’s TS-1 is up there with only a handful of similar products as serious competition.